The Labyrinth of Versailles was located just west of the Orangery in the southern part of the gardens. Created by André Le Nôtre in 1665 as a plain, undecorated maze, it was transformed in the 1670s according to a scheme attributed to Charles Perrault (1628–1703), who was the right-hand man of Colbert long before he started to write fairy tales. 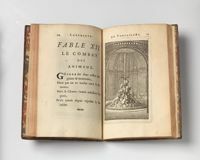 The new program may have been inspired in part by the 1668 publication of the first collection of the Fables of Jean de La Fontaine (1621–1695). The hedge-lined paths were furnished at their crossroads with thirty-nine fountains decorated with a total of 330 animals sculpted in lead and painted in realistic colors. Each fountain illustrated a classical fable and was accompanied by a tablet inscribed with a four-line version of the fable by the court poet Isaac de Benserade (1613–1691). Visitors could wander at their leisure, pleasantly lose their way, and search for the deeper moral or political truths hidden within the fabulous scenes they encountered. Difficult to maintain, the Labyrinth was neglected in the eighteenth century and finally destroyed in 1774. It was replaced by a grove in the English garden style, more to the liking of Marie-Antoinette. Only fragments of the fountains have survived. 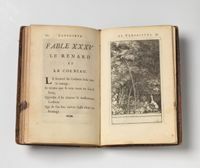 Wisely, this fragile gem had been immortalized in an official publication that combined Benserade’s verse with prose descriptions by Perrault and delicate etchings by Sébastien Le Clerc. The little book became very popular and was translated and copied throughout Europe. Some examples are presented here.